Dwyer solid plastic stationary gages - or draft gages - are offered in inclined and vertical (well-type) styles for highly accurate laboratory or general industrial service, for measurement of low range gas and air pressures, positive, negative or differential. To assure the accuracy required in instruments of this type, all machining of bores and wells is to the highest standards of precision backed by Dwyer's years of experience in the fabrications of acrylic instruments. Drilled Bore Accurate to ±.0002" free of bends or crooks, will not require recalibration because of distortion. Selected Gage Oil with high wetability characteristics forms a consistent, well shaped meniscus for most accurate readability. Adjustable Reflective Polished Aluminum Scales with thumbscrew locking for easy zeroing. Parallax-Free Reading for maximum accuracy and consistency is achieved by simply aligning the meniscus with its image reflected in the scale. 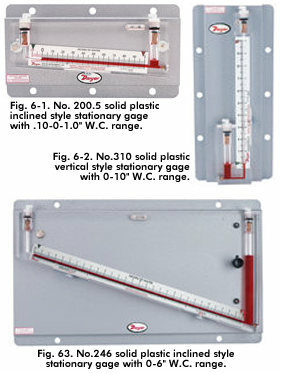 Leveling Adjustment for inclined style gages is achieved by simply loosening a locking thumb screw on the side or bottom of the gage, adjusting with reference to the integral sensitive ground glass bubble level and retightening. Heavy Gauge Steel Mounting Panels are gray hammerloid finished. Dwyer solid plastic gages and other gages are available in kits especially developed for air filter gage service. They include the gage, two static pressure tips with integral compression fittings ad two 5 foot lengths of ¼" aluminum tubing. The static pressure tips are installed in the duct upstream and downstream of the filter and connected to the gage to provide a continuous visual indication of the static pressure drop across the filter. When the filter's resistance in terms of static pressure drop reaches the maximum specified by the filter manufacturer, it is an indication that the filter should be cleaned or replaced. For complete details on Dwyer Air Filter Gage kits, refer to Pressure Section, Air Filter Gages and Switches. One extra bottle of .825 red gage oil, instructions and one set of type "a" connections, described below, unless other connection option is specified.